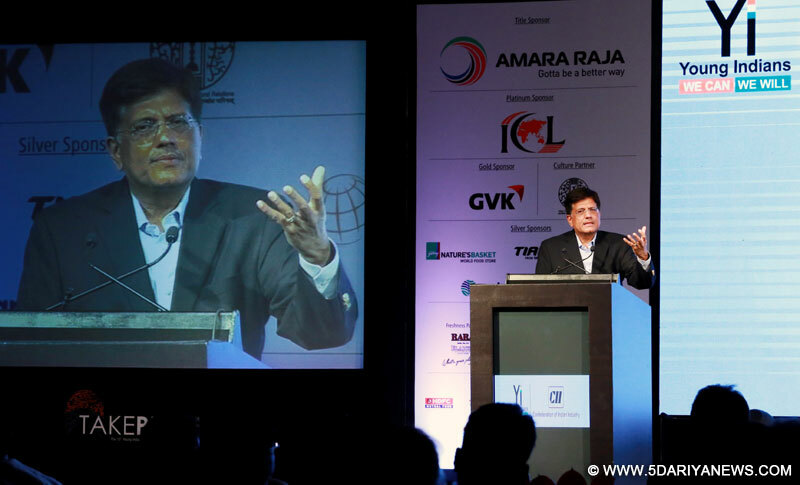 The Minister of State (Independent Charge) for Power, Coal and New and Renewable Energy, Shri Piyush Goyal addressing at the CII - Young Indians: Take Pride 2016 summit, in New Delhi on March 25, 2016. There are 50 million rural homes without access to electricity, union Minister Piyush Goyal said here on Friday.Addressing a session "Making India a Global Economic Superpower" at a Conference on Young Indians, Minister of State (Independent Charge) for Power, Coal and New and Renewable Energy Goyal admitted the country could never become an economic superpower unless it ensured equal opportunities for people at the bottom of the pyramid. "We cannot become a super economic power unless the person at the bottom of the pyramid gets equal opportunity to study, to be skilled and has the opportunity to move towards a better quality of life." "To my mind, lack of electricity access in villages across the country is a serious concern for us as a nation. There are about 50 million homes which do not have access to electricity," Goyal said.Goyal said that in Arunachal Pradesh, there were about 808 villages without any access to electricity. "While we are now working on building a grid in Sikkim and Arunachal, it will take time. Hence, we are looking at off-grid solutions in the interim. "The minister said he felt India could become a superpower if the economies of scale are leveraged, greater degrees of transparency introduced and proper monitoring of work ensured. "India is poised for decadal double digit growth in the days to come and is poised to become a superpower with a billion plus happy people." "India has the potential to transform and can move into the big league very rapidly if we leverage the economies of scale, bring in greater degrees of transparency and monitor work that has been undertaken," he said.Elaborating on the need to take a holistic view of the various programmes being implemented by the government, Goyal said: "There is a need to recognise the opportunities in the ecosystem and look at how these can be converted into an actionable agenda. "Highlighting the success of one of the key programmes of the Ministry of Power, Goyal said, "The LED programme in India is going to result in savings of 100 billion units of electricity annually and will benefit the consumers directly. In monetary terms, it will lead to savings of $6.5 billion annually. ""Given the environmental concerns, this programme will result in the reduction of about 80 million tons of carbon dioxide. This programme demonstrates how economies of scale can be leveraged to achieve a significant reduction in the cost of LED bulbs."